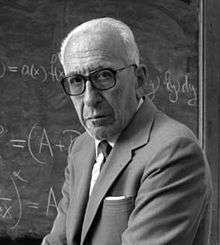 Alberto Pedro Calderón (1920–1998) was one of the leading mathematicians of the 20th century. He was born in Mendoza, Argentina. His name is associated with the University of Buenos Aires, but first and foremost with the University of Chicago, where Calderón and his mentor, the distinguished analyst Antoni Zygmund, started one of the longest (more than 30 years) and most productive collaborations in mathematical history. Together they developed the ground-breaking theory of singular integral operators, thus creating the "Chicago School of (hard) Analysis" (sometimes simply known as the "Calderón-Zygmund School"); this has been one of the most influential movements in pure mathematics, but with remarkable applications to science and engineering as well. Calderón’s work, characterized by great originality, elegance and power reshaped the landscape of mathematical analysis and ranged over a wide variety of topics: from singular integral operators to partial differential equations, from interpolation theory to Cauchy integrals on Lipschitz curves, from ergodic theory to inverse problems in electrical prospection. Calderón’s work has also had a powerful impact on practical applications including signal processing, geophysics, and tomography. Alberto Pedro Calderón was born on September 14, 1920, in Mendoza, Argentina, to Don Pedro Calderón, a physician (urologist), and Haydée. He had several siblings, including a younger brother, Calixto Pedro Calderón, also a mathematician. His father encouraged his mathematical studies. After his mother's unexpected death when he was twelve, he spent two years at the Montana Knabeninstitut, a boys' boarding school near Zürich in Switzerland, where he was mentored by Save Bercovici, who interested him in mathematics. He then completed his high school studies in Mendoza. Persuaded by his father that he could not make a living as a mathematician, he entered the University of Buenos Aires, where he studied engineering. After graduating in civil engineering in 1947, he got a job in the research laboratory of the geophysical division of the state-owned oil company, the YPF (Yacimientos Petrolíferos Fiscales). While still working at YPF, Calderón became acquainted with the mathematicians at the University of Buenos Aires: Julio Rey Pastor, the first Professor in the Institute of Mathematics, his Assistant Alberto González Domínguez (who became his mentor and friend), Luis Santaló and Manuel Balanzat. At the YPF Lab Calderón first conceived the possibility of determining the conductivity of a body by making electrical measurements at the boundary; he did not publish his results until several decades later, in 1980, in his short Brazilian paper, see also On an inverse boundary value problem and the Commentary by Gunther Uhlmann, which pioneered a whole new area of mathematical research on “inverse problems”. Calderón then took up a post at the University of Buenos Aires. Antoni Zygmund, one of the world’s leading mathematical analysts and a professor at the University of Chicago, arrived at the University of Buenos Aires in 1948 at the invitation of Alberto González Domínguez and Calderón was assigned to him as his assistant. Zygmund invited Calderón to come to Chicago to work with him. In 1949 Calderón arrived in Chicago with a Rockefeller Fellowship. He was encouraged by Marshall Stone to obtain a doctorate. Stone suggested that Calderón assemble three recently published papers into a dissertation, allowing Calderón to obtain his Ph.D. in Mathematics under Zygmund's supervision in 1950, only a year after arriving in Chicago. The dissertation proved momentous: each of the three papers solved a long-standing open problem in ergodic theory or harmonic analysis. The collaboration begun by Zygmund and Calderón in 1948 reached fruition in the Calderón-Zygmund Theory of Singular Integrals and lasted more than three decades. The Calderón-Zygmund memoir continues to be one of the most influential papers in the modern history of analysis; it laid the foundations of what became internationally known as the “Calderón-Zygmund School of Analysis” (or Chicago School of (hard) Analysis) which developed methods with far-reaching consequences in many different areas of mathematics. A prime example of such a general method is one of their first joint results, the Calderón-Zygmund decomposition lemma, invented to prove the “weak-type continuity” of singular integrals of integrable functions, which is now widely used throughout analysis and probability theory. The Calderón-Zygmund Seminar has been for several decades and continues to be an important tradition in the mathematical life of Eckhart Hall at the University of Chicago. By the mid 1960s the theory of singular integrals was firmly established by Calderón's contributions to the theory of differential equations, including his proof of the uniqueness in the Cauchy problem using algebras of singular integral operators, his reduction of elliptic boundary value problems to singular integral equations on the boundary (the method of the Calderón projector), and the crucial role played by algebras of singular integrals (through the work of Calderón’s student R. Seeley) in the initial proof of the Atiyah-Singer Index Theorem, see also the Commentary by Paul Malliavin. The development of pseudo-differential operators by Kohn-Nirenberg and Hörmander also owed a great deal to Calderón and his collaborators R. Vaillancourt and J. Alvarez-Alonso. However Calderón insisted that the focus should be on algebras of singular integral operators with non-smooth kernels to solve actual problems arising in physics and engineering, where lack of smoothness is a natural feature. This led to what is now known as the “Calderón program” whose first important accomplishments were: Calderón’s seminal study of the Cauchy integral on Lipschitz curves, and Calderón’s proof of the boundedness of the “first commutator”. These papers stimulated considerable research by other mathematicians in the following decades; see also the later paper by the Calderón brothers and the Commentary by Y. Meyer. Calderón’s pioneering work in interpolation theory opened up a whole new area of research, see also the Commentary by Charless Feffermann and Elias M. Stein, and in ergodic theory, his elementary but basic paper  (see also the Commentary by Donald L. Burkholder, and ) formulated a transference principle that reduced the proof of maximal inequalities for abstract dynamical systems to the case of the dynamical system of the integers. In his academic career, Calderón taught at many different universities, but primarily at the University of Chicago and the University of Buenos Aires. Calderón together with his mentor and collaborator Zygmund, maintained close ties with Argentina and Spain, and through their doctoral students and their visits, strongly influenced the development of mathematics in these countries. He was also visiting professor at universities including the University of Buenos Aires, Cornell University, Stanford University, National University of Bogotá, Colombia, Collège de France, Paris, University of Paris (Sorbonne), Autónoma and Complutense Universities, Madrid, University of Rome and Göttingen University. In 1950, Calderón married Mabel Molinelli Wells, a mathematics graduate whom he had met while both were students at the University of Buenos Aires. They had a daughter, María Josefina, who now lives in Paris and a son, Pablo, who lives in Connecticut. His younger son, Calixto Pedro Calderón, is also a mathematician. Calderón retired early from the University of Chicago, in 1985, and returned to Argentina, where his wife Mabel, who had been seriously ill, died. In 1989 Calderón came back to the University of Chicago on a post-retirement appointment. He also remarried in 1989: his second wife was the mathematician Alexandra Bellow, now Professor Emeritus at Northwestern University. Calderón died on April 16, 1998, at the age of 77, in Chicago, after a brief illness. Calderón was recognized internationally for his outstanding contributions to Mathematics as attested to by his numerous prizes and membership in various academies. He gave many invited addresses to universities and learned societies. In particular he addressed the International Congress of Mathematicians: a) as invited lecturer in Moscow in 1966 and b) as plenary lecturer in Helsinki in 1978. The Instituto Argentino de Matemática (I.A.M. ), based in Buenos Aires, a prime research center of the National Research Council of Argentina (CONICET), now honors Alberto Calderón by bearing his name: Instituto Argentino de Matemática Alberto Calderón. In 2007, the Inverse Problems International Association (IPIA) instituted the Calderón Prize, named in honor of Alberto P. Calderón, and awarded to a “researcher who has made distinguished contributions to the field of inverse problems broadly defined”. 1968 Member, National Academy of Sciences of the U.S.A.
1991 National Medal of Science, Washington D.C., U.S.A.
Calderón, A. P.; Zygmund, A. (1952), "On the existence of certain singular integrals", Acta Mathematica, 88 (1): 85–139, doi:10.1007/BF02392130, ISSN 0001-5962, MR 0052553, Zbl 0047.10201 . This is one of the key papers on singular integral operators. Calderón, A. P. (1958). "Uniqueness in the Cauchy Problem for Partial Differential Equations". American Journal of Mathematics. 80: 16. doi:10.2307/2372819. JSTOR 2372819. Calderón, A. P. (1963): “Boundary value problems for elliptic equations”, Outlines for the Joint Soviet - American Symposium on Partial Differential Equations, Novosibirsk, pp. 303–304. Calderón, A. P. (1977). "Cauchy integrals on Lipschitz curves and related operators". Proceedings of the National Academy of Sciences of the United States of America. 74 (4): 1324–1327. doi:10.1073/pnas.74.4.1324. PMC 430741 . PMID 16578748. Calderón, A. P. (1980): “Commutators, Singular Integrals on Lipschitz curves and Applications”, Proc. Internat. Congress of Math. 1978, Helsinki, pp. 85–96. Calderón, A. P. (1964). "Intermediate spaces and interpolation, the complex Method" (PDF). Studia Mathematica. 24: 113–190. Calderón, A. P. (1968). "Ergodic Theory and Translation-Invariant Operators". Proceedings of the National Academy of Sciences of the United States of America. 59 (2): 349–353. doi:10.1073/pnas.59.2.349. PMC 224676 . PMID 16591604. Calderón, A. P. (1980). "On an inverse boundary value problem" (PDF). Seminar on Numerical Analysis and its Applications to Continuum Physics, Atas 12. Río de Janeiro: Sociedade Brasileira de Matematica: 67–73. ISSN 0101-8205. ↑ Calderón, A. P. (1980), "On an inverse boundary value problem", Seminar on Numerical Analysis and its Applications to Continuum Physics, Atas 12, Sociedade Brasileira de Matematica, Río de Janeiro, pp. 67-73. 1 2 3 4 5 6 7 8 (2008) SELECTED PAPERS OF ALBERTO P. CALDERON WITH COMMENTARY, Alexandra Bellow, Carlos E. Kenig and Paul Malliavin, Editors, Amer. Math. Soc., Providence, Rhode Island, CWORKS/21. O'Connor, John J.; Robertson, Edmund F., "Alberto Calderón", MacTutor History of Mathematics archive, University of St Andrews .